For those who couldn’t make it to church this morning, I’m bringing it to you. Here is my sermon from this morning, along with some bonus photos/links. 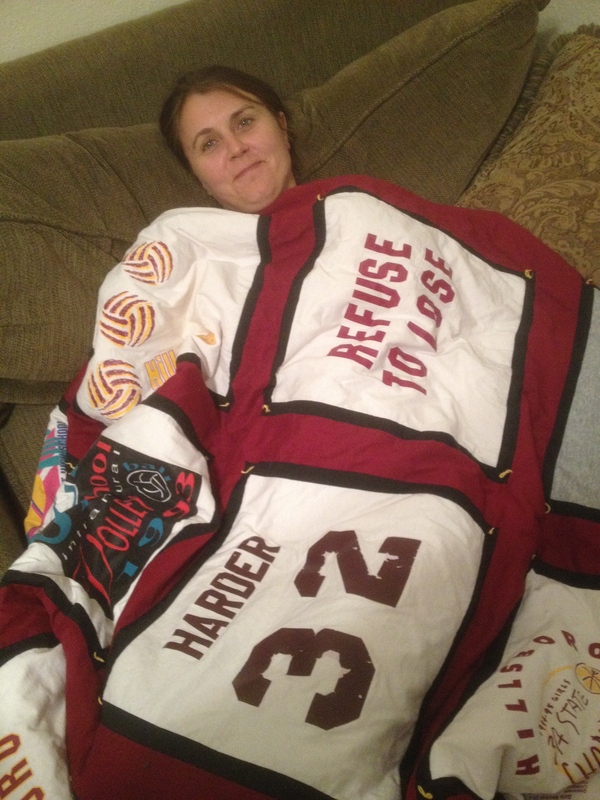 This blanket, made of all my old sports t-shirts, was gifted to me at high school graduation. Unfortunately in college I didn’t achieve the same level of success. Also around that time I started spending less time thinking about sports and gave more attention to my coursework, particularly my Bible courses. I remember being so captivated, maybe a little disturbed by this passage in Mark where Jesus invites everyone to be part of what sounds like a losing mission. Deny yourself; Pick up the cross, not a crown. I actually did a research project on this text in college and spent a whole semester interviewing as many people as I could, asking a variety of people what they made of this call from Jesus. My main take away from that project was that people’s responses were often different depending on their gender, race, country of origin, age, etc. Personally, I’m drawn to Peter in this passage, and his reaction to Jesus. You can’t blame him for not liking the prospect of losing. He, like many in his time, had certain expectations of Jesus. Jesus was thought to be the long-awaited Messiah who was to deliver them from Roman oppression. Generation after generation of people had waited and hoped for this Messiah. Finally the promise of a worldly crown, victory was within reach. That is precisely when Jesus began to teach them that he was about to undergo great suffering. Yes, there would be a crown, but not the kind they expected. Jesus was about to experience the ultimate rejection and loss. So outraged is Peter that he rebukes Jesus and Peter is rebuked in return. “Get behind me Satan, “ Jesus says. In other words, Jesus tells Peter that he has been deceived. Peter has misunderstood. Jesus was not clamoring after a worldly crown. Rather, Jesus was set out to transform the principalities and powers of this world that led to violence and destruction. This would result in a clash of epic proportions; it would result on Jesus’ death on a cross. For first century Palestinians, the cross meant one thing: death, a tortuous death. I read this week that the Romans would put up crosses like billboards as a way to establish Caesar’s supremacy. People were told that the cross awaited anyone who threatened Caesar’s kingdom. Now it’s one thing for Jesus to choose to defy Caesar and all that Caesar represented. But in this passage Jesus turns to the crowd and tells them that anyone who wants to become a follower or disciple must first deny himself or herself and take up the cross. What an invitation then and now?! Mark’s community was probably a persecuted community so for them, this was sort of a “have faithful endurance pump up speech.” Jesus was encouraging them to be courageous in the face of persecution. It’s a little tougher to know what relevance a passage like this has today for those of us who don’t necessarily feel persecuted on a daily basis. There are Christians around the world who do feel persecuted but most of us can’t relate to this kind of persecution and threat to our life and security as a result of our faith. And yet, I don’t want to let myself off the hook too quickly and assume that there isn’t anything here for us to ponder in our context. So what do we do with this call to deny ourselves, to pick up the cross and follow Jesus? Here I want to share a little bit of my own personal struggle, a struggle that I know isn’t shared by everyone, but in sharing perhaps it will inspire your own reflection on what this call has meant to you. When I was in seminary and in the years following seminary I started to develop higher and higher ideals for myself and for the church. I began to understand Jesus as this revolutionary figure, this prophet who tore Caesar, who tears every tyrant from his throne. I saw Jesus as confronting all that was greedy, corrupt, oppressive in this world and offering an alternative path for those who would be willing to follow, a path that included sacrifice, hard work (HARDERS LOVE TO WORK HARD), humility and courage. I desparately wanted to sign on to this vision. I still want this vision of Jesus to guide me and us. After a time though, following Jesus began to feel like an impossible ideal. I recognized my own limits, as well as those of others. Besides, sacrifice is not very fun, neither is losing oneself. In fact, in certain circumstances denying oneself can be wounding and destructive. It was a time of wilderness for me. I was one seminary student among many who was wondering what self-love means in the Christian paradigm. Many of us students, especially women asked: What does it mean to joyfully serve others, not just out of gendered obligation? And what does grace mean? We often spent time talking about whether we could follow Jesus and remain healthy. Can we hope without guilt to stay alive while following Jesus? Live simply that others may simply live; Forgive others with grace but scrutinize your own actions; Put others first, yourself last; Do not be gluttonous. Purity, purity, purity; Work harder to get close to God; Let your faith be visible. Sacrifice. Sarah was so fixed on this vision and unfortunately, somehow in the process she developed an eating disorder. She literally purged herself in order to be perfect. I felt justice and peace were so important that I would risk all for their sake, even though I knew I would be no good to the cause if I were sick. As I maintained leadership in the antiwar movement at my school, no one could tell me I wasn’t doing all I could to live an alternative, anti-greed lifestyle. Even as I got weaker, I saw my eating disorder as physical evidence of my triumph over the greedy forces in the world. But it wasn’t a triumph. I couldn’t ignore the toll my self-discipline was taking on my body. Eventually Sarah’s friends and her pastor helped her see how rigid her faith had become and how faith can often get distorted in times of isolation and crisis. She started identifying what she calls her “thinking errors,” both in her relationship with food and with God. Removing the pressure of the outcome of world situations from my shoulders to God, I stopped purging to be perfect. I am learning to respond to people’s questions about contradictions with a grace that comes from God. I am reminded of the necessity of celebration in spiritual disciplines. I don’t know what my sacrifices will be in the future, but I have gained the tools to sacrifice in a way that is life-giving. Sacrifice in life-giving ways. That is a phrase that I want to keep in my vocabulary. And I want to believe that Jesus would support this search for life-giving sacrifices. After all, Jesus told those who would listen that he would rise after three days. Sacrifice was part of the call, not the end game. Life, resurrected life, resurrected living, was the end game. That is the victory worth sacrificing for. The season of Lent he writes, is structured to help us remember the journey of Jesus to the cross. It is also a time for us to articulate again the call of discipleship. In these forty days we contemplate not only the wonderful power of the cross of Christ, but the power inherent in taking up our own crosses too. Opportunities are daily before us, times when we may give our lives sacrificially to acts of love, compassion, justice, and peace, even in the face of the same imperial forces of sin and death that confronted Jesus. In this season, we are wise to ponder, not only the cross, but the picture of Jesus on the road to Jerusalem, calling all his disciples to take up our own crosses and to walk with him in paths of love and service. After worship I asked the WorshipArts class where we should pour the leftover communion juice. Someone thought of the parking lot since we hoped everyone would have a safe trip home. 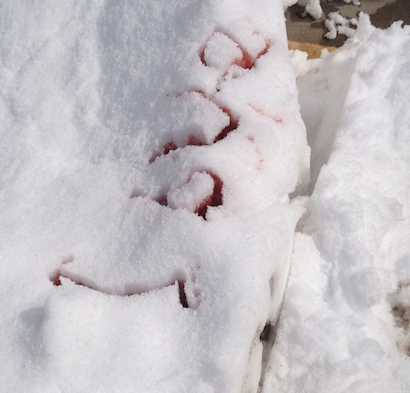 So we headed outside and spelled the word love near all the cars. Very nice sermon. I can relate to the sermon. Never give up was my motto in my younger days. Sorry we missed Sunday. Thanks for the message with the reminder to “take up the cross and follow Jesus.” – so easyto forget in our busy daily lives. Sorry we missed the service.